~Friday~ One of the reasons I don't want to change my cell phone plan is that I am "grandfathered in" (at least so far) with an unlimited data plan. 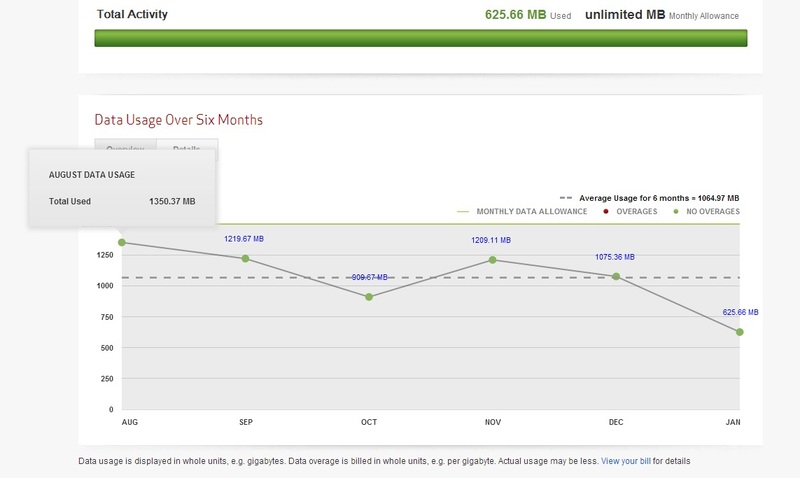 To that end, I don't ever pay attention to how much bandwidth I'm using each month, but I have often wondered what it is. Since I would say that I have a wireless connection about 50% of the time, and when I'm connected to that my usage automatically switches to that, I'm going to estimate that my "real" usage is probably close to 2G a month. Although, I have no intention of changing plans—and hopefully my "grandfathered in" status won't change, at least until my next renewal, which is in April of 2014—I like having an idea of my usage numbers. On a tangential note, I have a 700-minute (that was the minimum I could get) plan for talking, of which I used 70 in the month of January, and about 15 of that was my call to my parents.